The Air Defence Anti-tank System (ADATS) is a highly mobile low-level air defence unit capable of defeating a wide range of targets. 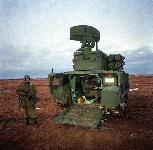 The ADATS has been designed to provide air defence protection for mobile troops as well as ground installations. This self-contained weapon system is mounted on the chassis of a M-113 tracked vehicle and will perform all its tactical functions during day or night and in adverse weather. Its ability to destroy air targets as well as ground targets, makes it a versatile weapon system. It was initiated after the Division Air Defense (DIVAD) program was terminated. Congress directed the Army to conduct comprehensive tests to determine how well the ADATS system would work in combat conditions. That operational testing of prototype vehicles revealed substantial reliability problems. Acknowedging those problems, the Army restructured the program and deferred procurement for at least two years. Under this revised schedule, production units would not get to Europe until 1995 or 1996. Because non-Soviet air threats to US ground forces are limited in number and capability, US forces can maintain adequate air defense assets with existing air defense fighters and with such defense systems as the Patriot, Hawk, and Stinger. The Department of Defense therefore terminated ADATS, and initiated a substantially less expensive alternative using the very effective Stinger missile. In 1992 Three Bradley STINGER Fighting Vehicles (BSFVs) were fielded to heavy divisions and the US Army Training and Doctrine Command (TRADOC) during the year. 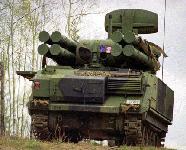 The BSFV was an interim solution to the void left by cancellation of the Air Defense Antitank System (ADATS). The BSFV consisted of a standard BFV with racks mounted inside to hold STINGER weapon rounds and MANPADS teams to fire them. In service with the Canadian Forces since 1989, a total of 36 ADATS were procured as part of the Low Level Air Defence (LLAD) Project. The LLAD project also acquired twenty 35-mm guns, 10 Skyguard fire control systems and all LLAD facilities and support systems. The value of the LLAD project was $1.09 billion.